This article details the pipe spacings and depths for closed loop thermal collector pipes serving Ground Source Heat Pumps. 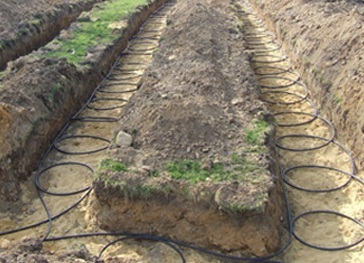 The spacing of holes will depend upon ground conditions and the available energy in the ground. Typically boreholes should be placed at no less than 5 metre centres and at least 2 metres from a building, although 5 metres is better. •Pipework must sit on 100mm of sand with 150mm minimum cover above the top of the pipe. Marker identification tape must be laid above the pipe. •Lay pipes at a minimum depth of 800mm; 1000mm is the ideal depth. If this depth cannot be achieved, then both the flow and return pipes will need to be thermally insulated. •The trench pipes will need to be thermally insulated. Provided the above trench depth is achieved, only the flow pipe needs to be thermally insulated along it´s entire length between the building and the boreholes. The return pipe should be insulated within the last 2 metres of any manifold location. •All thermal collector pipes must be thermally insulated within 1.5 metres of the building and wherever it crosses drainage pipes. •Where there is an external manifold all pipework and fittings within the manifold access cover should all be thermally insulated. •All pipes between manifolds and bore holes will need to be thermally insulated where pipes are in close proximity. Pipework with a separation distance less than 1000mm should be thermally insulated. •All pipes crossing water mains or drains must be thermally insulated 1000mm on each side of the crossing point. •Lay pipes at a minimum depth of 1200mm; 1450mm is the ideal depth to account for sand fill. •Minimum trench width should be 600mm; 900mm is preferred width as the looped pipes should be 600mm apart. •Space trenches 1000mm apart. More distance is better. •Pipe loop length should not exceed 100 metres, that is, a 50 metre long trench. This can be increased if larger diameter pipe is used. •Trenches should be a minimum of 1000mm clear of all buildings (obviously the circuit will need to extend to the property). •The last 1000mm of pipe up to the property must be thermally insulated.